Both of these foot conditions, bunions and Morton’s neuromas, can be caused by compression of the forefoot and I’ve suffered from both conditions in both feet since my 20’s. Shivering in the cold, I still took my shoes off to let my feet spread. In hindsight, my pain is hardly a surprise because I never have had shoes that were wide enough for my “Fred Flintstone” feet. My toes don’t taper but flare and my feet are rather thick so they also suffer in shoes without a deep toe box. Even ‘sensible’ shoes damage my feet. For me the equation is simple: Shoes = Pain. When I must wear shoes, I wear them for the absolute shortest amount of time, like when hiking in snow. After a shoe session, I usually do a little rehab on my feet to prevent experiencing several days of pain from the compression. Bunions are bony bumps that develop on the joint at the base of the big toe where the big toe joins the foot. The experts argue about the cause of bunions though it’s well accepted that pressure on the big toe, from the side or elsewhere, makes them worse. And once a bunion is fired-up, any pressure on the bunion can be excruciating. Some believe that pressure is usually the cause; others think genetics play the biggest role in causing bunions and that pressure only makes them worse. And still others have observed that bunions aren’t seen in cultures that don’t wear shoes. Certainly for me, viewing the elimination of pressure from sides of my toes has been my pathway out of bunion pain. When my bunions first appeared 40 years ago, they were so painful that I still vividly remember seriously contemplating taking off my sensible shoes and walking barefoot the rest of the way home from work in deep snow. I was nearly in tears because of the unremitting pain. My homemade metatarsal lifts crafted from silicon gel metatarsal pads. Like bunions, there are several conflicting opinions about Morton’s neuromas. The prevailing opinion is that Morton’s neuroma is an historical but inaccurate name for enlargement of the sheath covering a nerve between the bones in the ball of the foot. Others maintain that it is an enlargement of the nerve itself. There is agreement however that Morton’s neuroma almost always occurs between toes #3 and #4 (the big guy is of course, #1) though they can occur between #2 and #3. The problem area is between the bones in the thick of the forefoot. They can produce a nasty burning pain that doesn’t readily go away when the pressure is removed. Like bunions, Morton’s neuromas are most often associated with sideways compression of the foot. Like with bunions, I’ve experienced inhibiting pain, pain that kept me from continuing-on on my feet. More recently, I’ve been able to confine my neuroma pain to cycling in cycling-specific sandals (which are roomier than shoes) and by inserting a homemade metatarsal lift. When the pain became too intense, I’d urgently call a halt to our ride for 5-10 minutes to back the pain down to a tolerable level. If you are a fellow sufferer of either condition, the first step towards reducing your pain is literally to get out of shoes. Take them off right now if you are wearing them. And rip off your socks too because they also squeeze the foot. Wiggle your toes and invite the feet to spread and soften. The less time spent with anything confining your feet, the better. I began the slow process of rehabilitating my feet 35 years ago by switching from shoes to Birkenstocks. Even Birkenstocks crowded my feet a bit but they were a big improvement. They are no longer my first choice for footwear but they were the best option at the time and I wore them almost exclusively for about 10 years. Sandals have been my mainstay footwear for the last 25 years with Tevas being my favorites though I wore Chacos for a number of years. Even in these sandals, I must still ensure that none of the straps cross my bunions. Crocs in their original wide form are a good choice for many these days, though they are a little too narrow for me to wear for hours. I use Crocs for brief periods as outdoor slippers. My 2 best-fitting shoes fail the insole test for sufficient width. The best way to vet shoes is to pull out the insoles and stand on them. If any part of your foot spills over the edges, the shoe is too narrow. 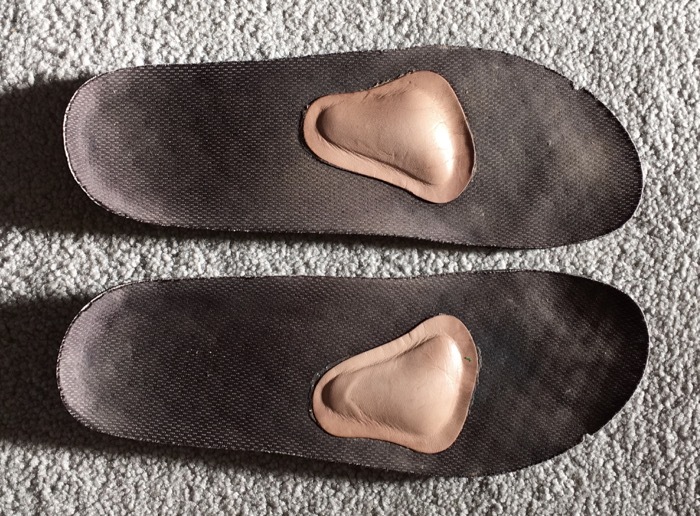 If insoles are absent or aren’t removable, stand on the top of the shoe to check the width. And don’t even think about wearing high heels if you want to eliminate forefoot pain. When selecting footwear, be attentive to both the width of the toe box and the severity of its taper. Thousands of years ago, the silly notion that toes taper to a point became embedded in shoe styles and we've been stuck with that shape ever since. Toes should radiate from the bones in the feet like fingers radiate from the bones of the hand. Toes should spread away from each other, like the toes of a baby's foot, not be squished together. The shoe should be wide from your bunion bone almost to the tip of your toes—shoes should be blunt, not pointed at the ends. In my feet, it feels like the lateral compression at the level of the bunion bone contributes to both my bunions and Morton's neuroma whereas the compression of my toes primarily irritates my bunions. A tapering toe box pushes all of the toes together, but especially the big toe. When the big toe is pressed towards the midline, the distorted position leverages the big toe joint outward, where the bunion forms. Having that bunion bone jutting out effectively makes your foot a little wider and puts more pressure on the disturbed joint, resulting in more inflammation there. It becomes a vicious cycle. The only way out of the cycle is to coax the big toe to again take its rightful position pointing straight forward without any compressive forces on it. A Portland podiatrist, Dr Ray McClanahan, is a fervent advocate of natural foot care and he believes that shoes are the culprit in most foot pain. He promotes wide, flexible shoes that are completely flat as the first step in preventing and curing most foot problems. He wants shoes that allow the foot to live like it was barefoot, so that means zero heel lift and zero toe spring, which is the essentially universal upwards arc of the front end of shoes, especially in running shoes. I can verify that shoes with significant toe spring are really nasty for Morton’s neuromas because they spread the ball of the foot open and press the tender neuroma into the insole. His website www.nwfootankle.com provides a wealth of information to aid in establishing a new relationship with your feet. After getting out of shoes, my next intervention was stretching my feet, something I still do regularly. The most gentle way to begin the opening process is by rolling the sole of your foot over a tennis ball while standing. A more advanced technic is rolling over a hard spikey ball while standing—a ball that’s about the size of a golf ball. This myofascial release (MFR) technic puts painful pressure on both muscle and fascia with the intent to remove “densities” or knots with steady pressure. Sitting in a chair or on the floor and working towards being able to interlace yours fingers of one hand with your toes on the opposite side will also invite more space between the bones in the foot, which is needed for neuromas to be more comfortable. Such spreading also gives the big toe a nudge towards its proper alignment which can be a step towards reducing bunion pain. Look around and you’ll readily find other recommendations for stretching your feet. It’s a slow process and work towards having a number of stretches to choose from to keep it interesting. Pictures of my stretches and other strategies is on the last 2/3 my 2011 "Forefooting Prep" piece at this link: http://2011.travelfit.us/Traveling_with_a_Fitness_Focus/FF12_Feet.html. The goal is to be hardware-free with your feet, including orthotic-free, but along the way, aids will help. Dr Ray McClanahan at the above mentioned NW Foot & Ankle in Portland has designed and sells Correct Toes silicon toe spacers. They were $65 for a pair when I bought mine and I found them to be helpful. He wants his patients to wear them all the time but given shoes aren’t wide enough for my feet, wearing toe spacers in footwear was out of the question for me. And I know one professional that argues with Dr McClanahan about full-time use of Correct Toes because she thinks that they can cause other problems. Correct Toes: above = unaltered; below = last toe slot cut-off. I did whack 1 toe compartment off of each of my spacers so I could tolerate wearing them in my cycling sandals. I used several other of McClanahan’s scissor tricks to modify the spacers to my feet. He gives guidance on nipping them in a YouTube video you can access from his website. Years before I saw McClanahan, I bought single toe spacers from a pharmacy. 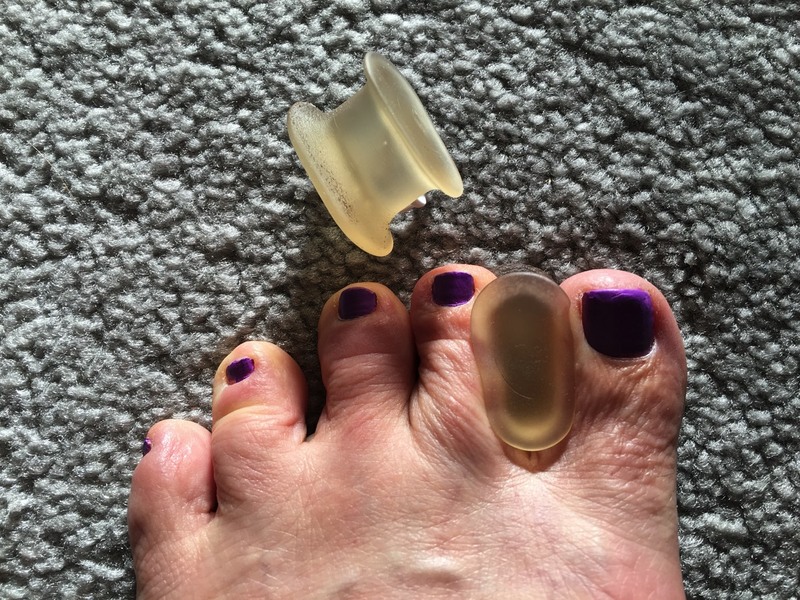 I wore them between my big toe and the second toe in cycling sandals and even they were enough to reduce my bunion and Morton’s neuroma pain somewhat. They were especially helpful in combatting the stiffness of new cycling sandals. McClanahan frequently prescribes (and sells) metatarsal pads which are placed in the shoe to relieve neuroma pain and solve other problems. They are tricky to place correctly and the self-adhering sticky stuff isn’t hefty enough to use in my hiking sandals but I believe that they are a good strategy. I’ve also used inexpensive plastic braces for my bunions. The packaging recommends using them while you sleep but that was a non-starter for me. They looked like they’d snap or come off when I rolled over. I’m also sleep-challenged and the generally uncomfortable nature of the braces felt like a prescription for insomnia. I’m not a fan of them but I do use them during waking hours from time to time. Oh, and don’t even think about walking with them on. My 2016 cure-all for all of my muscle/joint/athletic performance issues was do-it-yourself myofascial release (MFR) using assorted firm balls to apply as much pressure with them as I could tolerate to the afflicted areas. I was quite surprised to see my feet almost change before my eyes when I aggressively began using MFR on them in the summer of 2016. The slow part of the MFR project that I didn’t recognize was benefiting my Morton’s neuromas was working on the backside of my lower body. Because of the way the nerves in the feet are wired up, stretching and massaging the glutes (the big muscles in the buttocks), the hamstrings (back of the thigh muscles), and the calves can all take some of the tug off of the painful foot nerves. 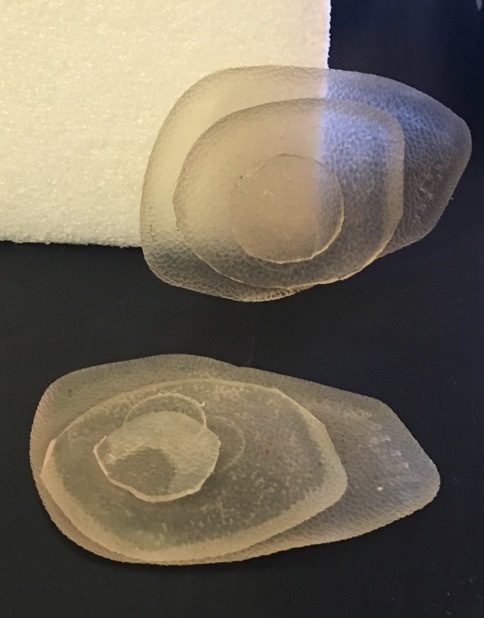 Using 2 balls to mobilize tissue using "smashing" technics. I shifted from emphasizing my quads during my myofascial release or ‘smashing’ sessions to those ‘backside’ muscles in March of 2016 and that work undoubtedly contributed to the improvement in my feet. I’ve received a lot of sport massage work over the decades but the smashing was clearly a new modality with different and needed effects on those tissues in me. The almost-before-my-eyes change in my feet occurred when for some reason I decided to aggressively start smashing the tops of my feet—the usual treatment strategies for my problems were always for the bottoms. 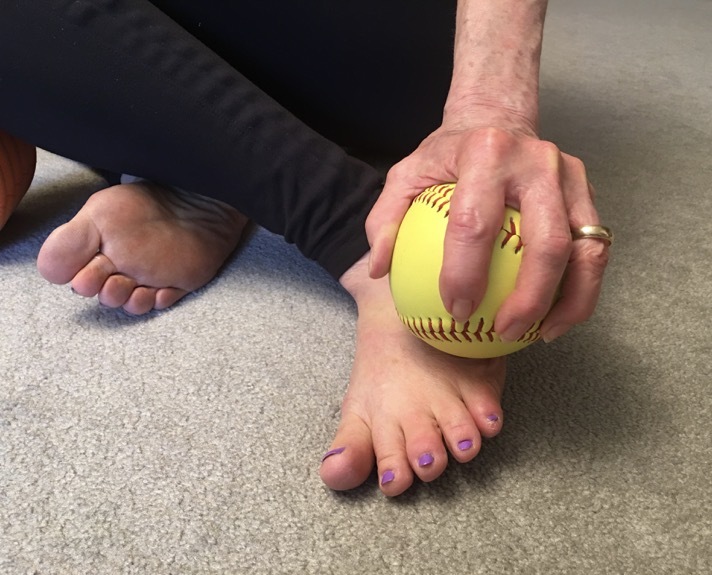 We only had 2 balls with us at the time and I positioned the smaller, softer T-ball on the floor and under the ball of my foot so my toes gripped or curved over it while I was seated on a chair. I’d bend over, resting my chest on my thighs, and apply all of my available force to the top of the foot through our 5” hard foam ball though the size of the ball doesn’t matter. I slowly rolled the ball with intense pressure across my toe nails and then worked my way across the length of my toes. I crossed the knuckles at the junction of the toes and foot and continued working crosswise to the ankle. I’d then slowly work the foot length-wise, especially between the bones of the foot. That’s when I realized that I might be able to further open the space between the toe bones to take even more pressure off of my Morton’s neuroma. I was no longer wandering and exploring, I was suddenly on a search-and-destroy mission and feeling the benefit almost as I did the work. "Scraping" the top of the foot for Morton's neuroma MFR. 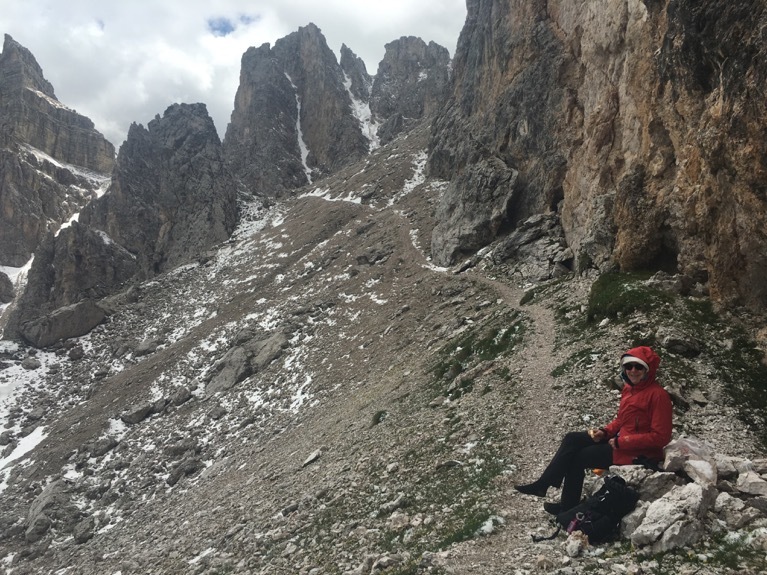 The smashing on the tops of my feet was less painful than the work I’d been doing elsewhere in my body but I could feel that it was equally effective—I could immediately feel subtle but welcome relief in my feet. After several days of this aggressive smashing, we happened to ride our bikes, an activity that readily triggers my neuroma pain because of the rigid cycling sandals with the dreaded toe spring. Even after hours of high-power transfer through my feet on my loaded bike in the mountains, I was pain free. I was optimistic that I’d never feel my Morton’s neuroma pain again. 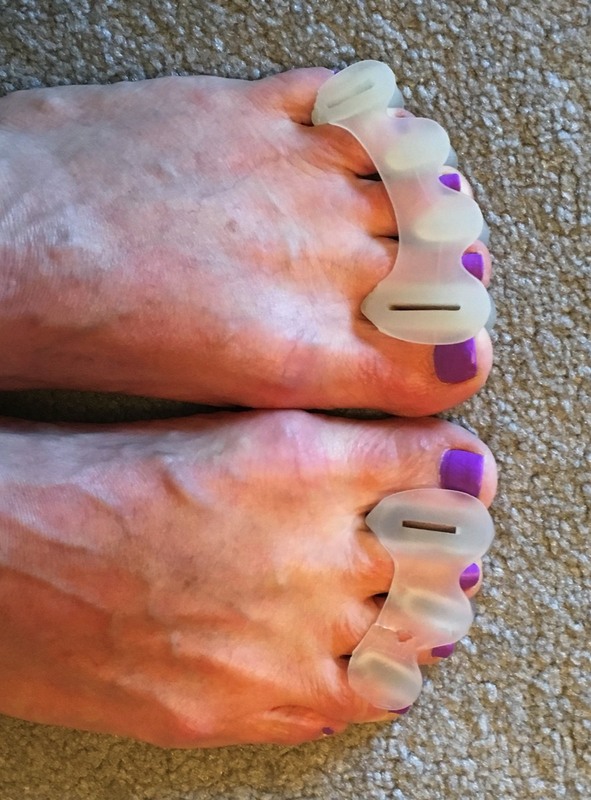 Excited about my rapid progress with my Morton’s neuromas, I went after my bunions. I used the exact same positioning of the balls but draped my big toe a little bit down the side of the T-ball. Because my bunions are in remission, I was able to apply pressure on the bunion area itself and then worked diagonally and longitudinally over the top and outer edge of the toe. I envisioned stretching and lengthening the soft tissue on the top and side of the entire length of the big toe. The work wasn’t as startling as with my Morton’s neuroma, but it seemed to make my big toes a little more comfortable, a little more mobile. Placing a thumb or silicon toe spacer between the big and second toe helped stabilize the big toe while I worked the thin layers of tissue. It’s highly likely that smashing was immediately perceivably effective in decreasing my issues with Morton’s neuromas and bunions because I’d already done decades of other interventions. But maybe, just maybe, others can measure their relief from these painful foot conditions in months or years instead of decades by using myofascial release from the outset of their foot rehab program. I continued my fancy foot work into the fall, finding new ways to work both the bunion and Morton’s neuroma areas. Sitting on the floor with one supported knee bent into kind of a chicken wing position, I would press and slowly drag a ball on the top of the foot towards the floor like I was scraping it. I’d begin the deep stroke between my Morton’s neuroma foot bones and dragged the skin and ball towards the little toe and the floor. I worked from the ankle to the toes, feeling the variations in tissue density along the way. This seemed to open up the space between these lateral bones even more. 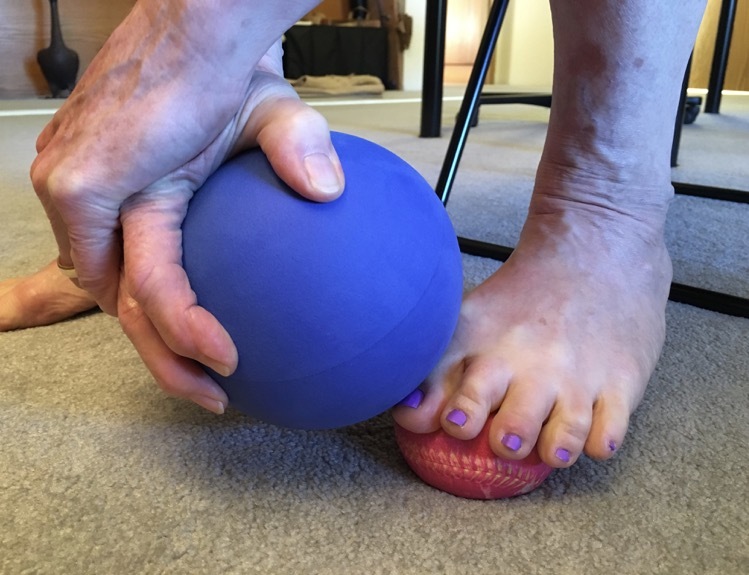 Pressing and dragging the ball to mobilize the tissue around the bunion. Massaging and using high-pressure MFR along the side of my arch from the ankle bone to my bunion relieved densities in that area, which includes a muscle that controls some of the big toe movement. 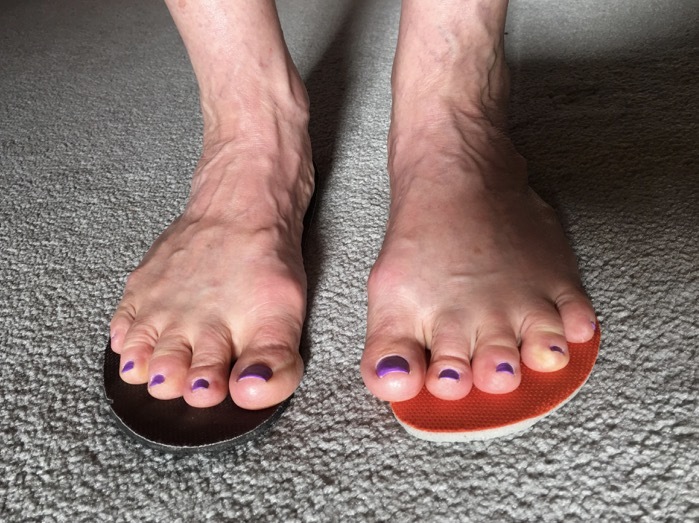 The drift of my big toes towards the second toes as a result of the bunions had weakened the big toe muscles in me and the first step to reversing that change was to mobilize the tissues. With the big toes moving more normally, I could make faster progress in strengthening their muscles. I worked my big toes in 2 directions: up and down and sideways, which is especially helpful for bunion recovery. With my foot supported off of the ground, I commanded my big toe to strongly press downwards, leaving the other toes behind. My left big toe couldn’t budge, but my right one could. I did both brief reps and 10 second holds to both work on the coordination and to strengthen the right foot muscles. With the learning that occurred fairly easily on my right foot, I returned to the left, insisting that it at least try. Within a couple of days, I had the neuromuscular patterning in place and switched my focus to strength work on the left big toe. Once you can control the movement pattern, you can do your toe presses almost anywhere, like sitting in a car. Toe presses to strengthen specific foot muscles. Harder for me was opening my big toes away from their second toes and towards each other. In the air or on the floor, command your big toe to move sideways, not up or down, but sideways. Again, this was more possible with my right big toe, so that is where I started each session. Bill discovered a nifty assist if the big toes just don’t budge, which is to press a thumb or finger into the side of the arch a little way back from your bunion towards the ankle. Here you will find the muscle you use to both slide and press with your big toe. For me, being able to feel the muscle contractions under my thumb was my first measure of success even though the toe didn’t visibly move. I settled for that as positive reinforcement until a toe actually started moving. Progress for me on this movement was measured in years with my left toe whereas the toe presses nicely progressed in days. My first yoga teacher used to say “People die from the feet up.” I didn’t really get it, but it was such a strong statement that I retained it. Now, many years later, I get it. I can see the deadened, detached relationship that some older people have with their feet. Their feet are almost treated as ‘other’ rather than a part of themselves. Their feet become an ever increasing source of pain and ailments and the lack of the mobility in the feet could contribute to falling. My slow progress in reducing my foot pain and making my feet more vital by embracing minimalist shoes since 2009 has convinced me that dying from the feet up isn’t inevitable, that my demise will come but not from my feet.